Vermilion Parish, home to a large number of Cajuns, has its vital records with the Court Recorder, located in the Clerk of Courts in the Courthouse building in Abbeville, LA., on 100 North State St., in Room 101. 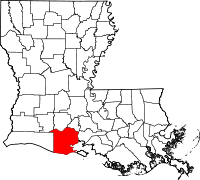 Vermilion Parish, which is named for the Vermilion River which flows through the parish, is located on the Gulf of Mexico and is part of the LafayetteAcadiana Combined Statistical Area, and area comprised of six parishes total and is known as the Cajun Heartland, as well. The area has a history of ethnic diversity as French, Spanish, British, Italian, African, and other nationalities all settled there in the 18th and 19th centuries. The primarily influence, however, was predominantly French, which, when combined with the large number of the other cultures in the area, especially the African influence, resulted in what is known today as the Cajun culture.